I am really quite a tamale snob. Let me explain. You see, the ratio of well prepared tamales to terrible tamales is currently around 1 to 100. What makes a bad tamale? First, the masa. 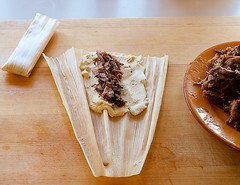 A bad tamale has either dry, crumbly masa, or gooey, undercooked masa. Typically you see the former, which is why a lot of tamales are served with some sort of chili sauce to disguise their crimes against corn. 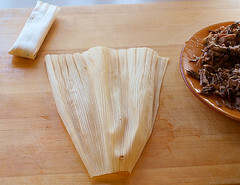 Second, bad tamales have a greasy filling made of either pork or beef. Primarily a greasy filling is due to the use of low quality (a.k.a. cheap) meat. Sub-par tamale makers are in it for the profit, and cheap meat in the filling increases the profit margin. Sadly, eater enjoyment decreases. 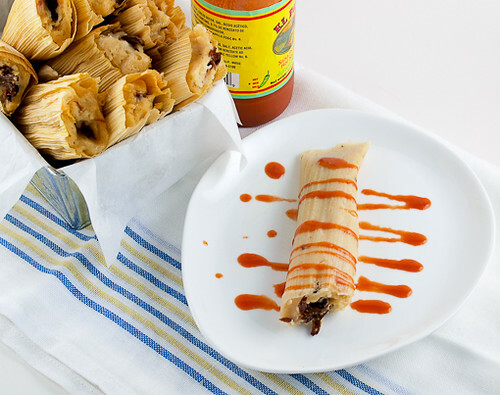 Tamale filling should be tender, juicy, but never greasy. 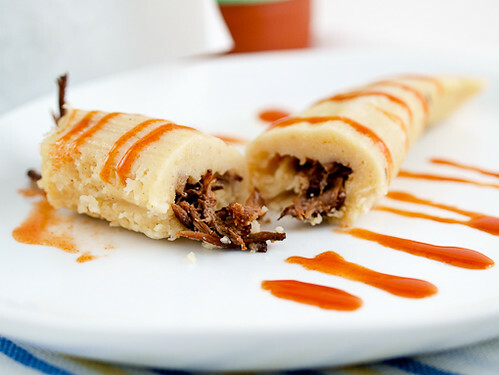 People are used to bad tamales because they are so prevalent. I know a lot of people who hate tamales because they have never had a good one. That is a sad, sad thing. 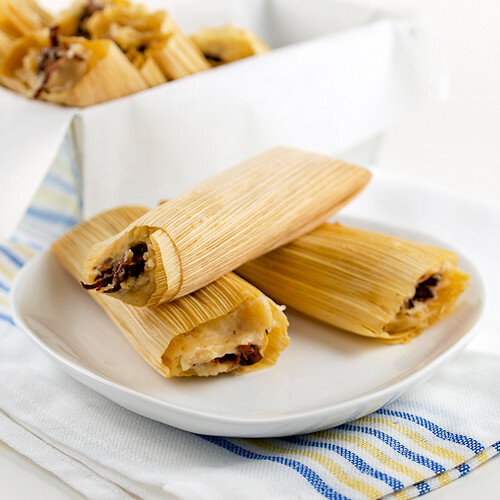 This tamale recipe is an amalgamation of different recipes I have tried over the years, combined with an amalgamation of different techniques for preparation to create, at least to my mind, the perfect tamale. Beef short ribs are my filling of choice here, mostly because they are tender, moist with out being greasy, and their flavor can stand up to the masa. Speaking of masa, I make mine with pork lard and I add a finely minced chipotle pepper to the mix for a little extra flavor. 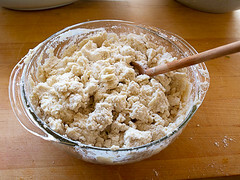 If lard is not your thing you can use vegetable shortening, but it will not have the same savory taste. I have never been able to figure out why people do not add more flavor to the masa … it is begging for it. These tamales are a little time consuming to make all in one day so may I suggest the following schedule for preparation? 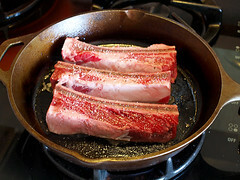 Day 1 – Braise the short ribs. 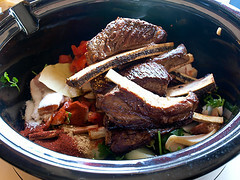 Do not shred, but store in the refrigerator in some of the braising liquid. 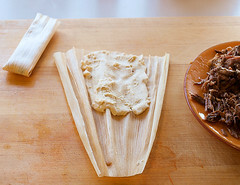 Day 2 – Soak the corn husks, prepare the masa, make up the tamales. 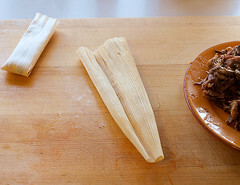 Day 3 (optional, since you can do this on day 2) – Steam the tamales, cool, re-steam and serve. Yes, it is a process but the first day is 8 hours of doing nothing. The second day is a little busier, but nothing too strenuous. 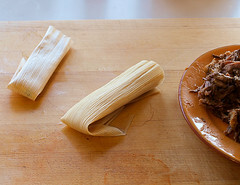 Besides, a pot of moist, fragrant beef tamales is worth the effort. Heat a medium skillet over medium high heat. Once hot add the oil. While the oil heats season all sides of the ribs. Once the oil is shimmering add the ribs and cook until the ribs are darkly browned on all sides, about 3 to 5 minutes per side. While the ribs brown add the bacon, onion, garlic, Rotel, cilantro, bay leaf, cinnamon, cumin, paprika, chili powder, coriander, and salt into the slow cooker. 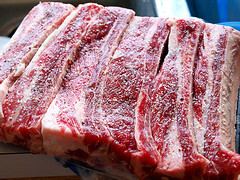 Top with the ribs and add enough beef stock to just cover the ribs. Add water if needed. Cook on low for 8 hours, then turn off the slow cooker and cool for 1 hour in the liquid before transferring to a container to cool completely. Once cool shred the meat. While the ribs cool prepare the corn husks. In a deep dish or pot add the corn husks and cover with hot, but not boiling, water. Weigh the husks down with a plate so they are totally submerged in the water. Soak the husks for 2 hours, or until very soft. Drain and rinse the husks well to remove any dirt. Reserve 5 for lining the steamer. While the husks soak prepare the masa. 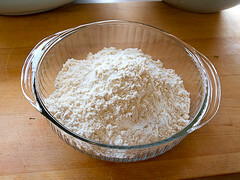 In a medium bowl combine the masa with the warm water. 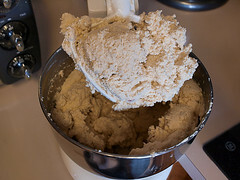 Mix until the masa forms a shaggy, dry paste. Set aside. 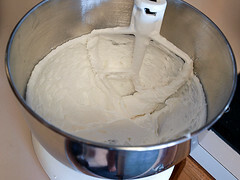 In the bowl of a stand mixer combine the salt, baking powder and lard. Beat with the paddle attachment on medium speed until very light and fluffy, about 5 minutes. 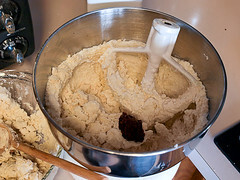 Reduce the mixer to low speed and add the chipotle pepper along with the masa mixture in 4 additions, making sure that each addition is well mixed before adding the next. Slowly add 1 cup of the broth to the mixture and once combined increase the speed to medium and beat for 5 minutes. Test the masa by scooping a small ball and dropping it into a cup of water. If the masa floats you have mixed it enough. Cover the masa with plastic and chill for 1 hour. 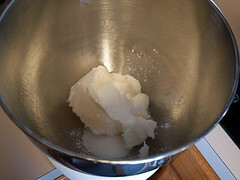 Once chilled beat the mixture again and add the remaining 1/2 cup of broth to loosen the dough. It will be sticky. Test the mixture again by scooping a small ball of masa into a cup of water. Once it floats it is ready. To assemble the tamales begin my laying out one corn hush with the tapered side facing you. 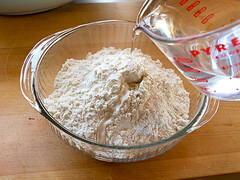 Spread about 1/4 to 1/3 cup of masa into the wide end forming a 4-inch square. Place 1 to 2 tablespoons of the shredded short rib meat in the center of the masa. 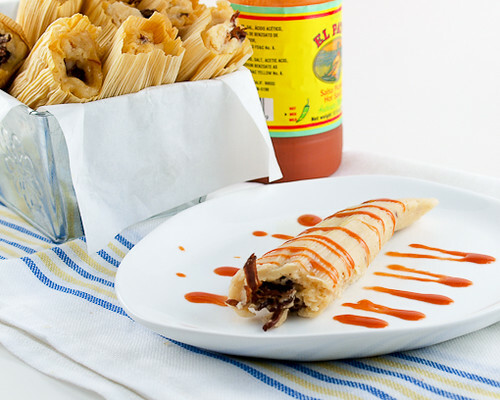 Fold the corn husk in half to enclose the meat, then roll the husk to seal the tamale. Fold the tapered end of the corn husk up and place the tamale seam side down on your work surface. Repeat until all the tamales are made. Once all the tamales are rolled prepare the steamer. Begin by lining the bottom of the steamer with 1 or 2 corn husks. The bottom should not be completely covered otherwise the steam will be blocked. 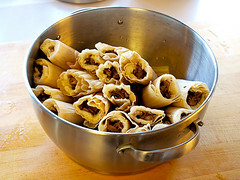 Place the tamales into the steamer basket with the open end facing up. Be sure not to pack the steamer. The tamales need room to expand as they cook. Cover the tops of the tamales with the remaining corn husks. 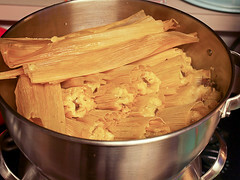 Cook the tamales over rapidly boiling water for 75 minutes (1 hour and 15 minutes), or until the masa comes easily away from the corn husks. If the steamer runs out of water refill with boiling water. You can serve the tamales now, but for the best texture cool the tamales down to room temperature, you could even chill them for a day or two at this point, then steam them again for 15 minutes, or until hot. Serve with hot sauce, if desired. Enjoy!